The university placement programme at Manchester International School (MIS) has an impressive track record, as graduating students have received offers from many universities. Students are guided and counselled on matters concerning higher education by an in-house career counsellor. This is supplemented by conduct of on-campus information sessions, visit to university fairs, and workshops and exhibitions by visiting universities. One-on-one consultation sessions are facilitated by the career counsellor to provide necessary support to students with their university research and application process. Students at Manchester International School have an option of pursuing the Cambridge AS and A Levels in Classes 11 and 12. 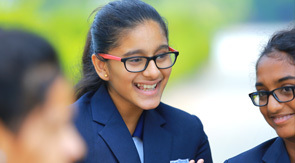 The holistic education approach at Manchester International School enables students to gain maximum exposure through various learning opportunities provided by the school, which in turn strengthens and distinguishes their. We take university preparation seriously to ensure the best possible outcome for the individual student. Regular counselling sessions advises students and parents on course choices and guides their way through the application procedures of university systems around the world. We are a registered centre for UK UCAS registration. Since there are so many choices for students, we also invite universities and colleges to visit the school and allow students to engage with university staff in person to explore new options and get more experience with the college and university application process. We are happy to inform that Manchester International School career development centre is always in touch with all the top foreign universities for organising periodical in-campus university fairs, where students get much clarity about the placement process of universities from the delegates and members representing from the various universities around the globe. Many foreign university directors, on a regular basis, visit our school campus to recruit the finest among our students.Internally, we have a set of experienced counselors to guide our students in terms of applications processing and screening of universities.